Find the packets you are looking for! DeepSearch is at the core of what makes CloudShark unique for managing and storing your entire repository of PCAP data. Our innovative technology allows you to search across the PCAP files in your archive and find individual packets in each of them. DeepSearch lets you get more out of your capture archive by finding packets that match standard Wireshark filters. 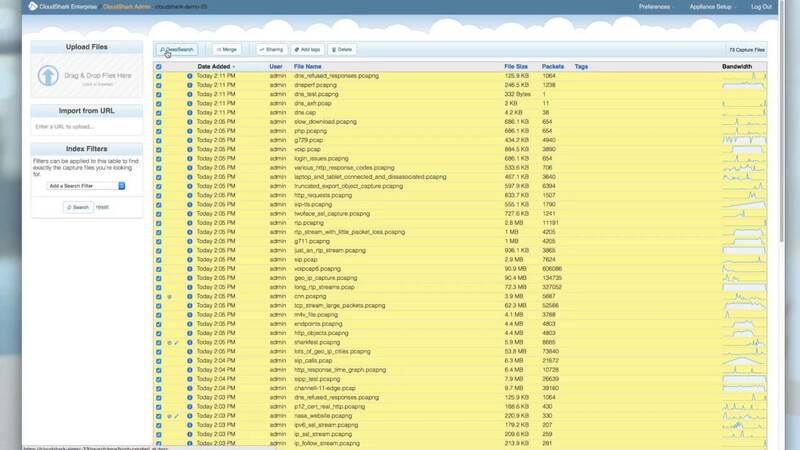 Select a set of captures, run DeepSearch, and CloudShark will identify the captures containing those packets. Then use the web-based analysis to drill-down, share, and resolve your issue. Because we use standard Wireshark display filters, there’s no new query language to learn and any protocol that is able to be dissected can be searched on! Watch our 30-second overview video for a look at this feature.